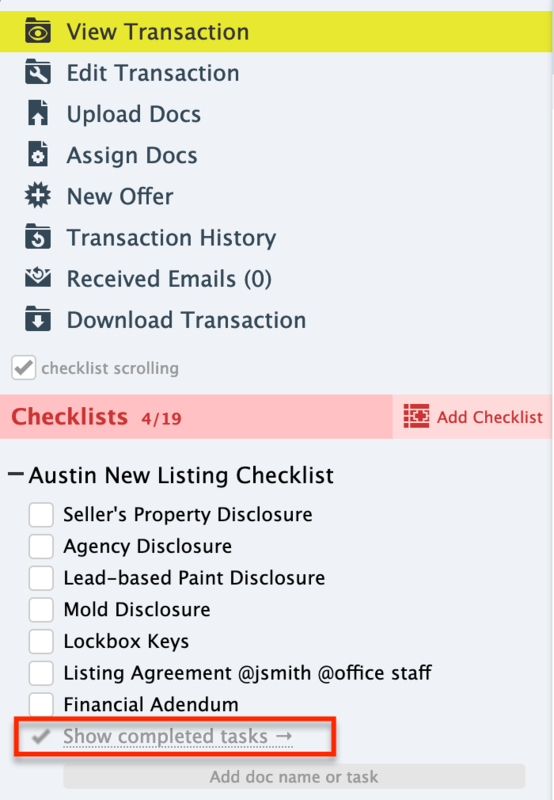 Completed tasks can be set to be hidden on transaction checklists. Hiding completed tasks reduces clutter and makes checklists easier to manage. Master Admins can set their account to hide completed tasks by default on transaction checklists. Check the option to “Hide completed tasks in transaction checklists”. Scroll down and click [Save Settings]. When an account is set to hide completed tasks, completed tasks will be hidden by default on transaction checklists. To view completed tasks, click “Show completed tasks”. To re-hide completed tasks that have been shown, refresh the page.